Have you ever been swimming and experienced a sudden drop in temperature in the water near your feet, while the surface water remains a comfortable temperature? What you are experiencing is thermal stratification—when lakes “divide” into different layers of density due to differing temperatures. 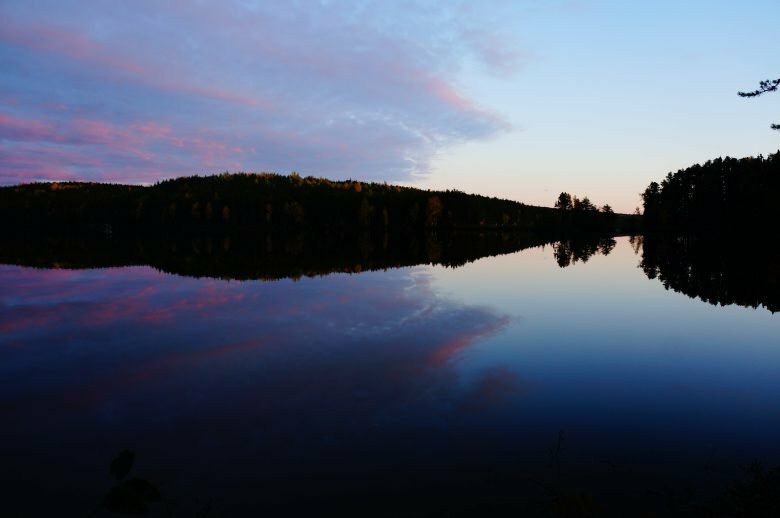 When spring turns to summer, most Canadian lakes, including those at IISD Experimental Lakes Area, experience both thermal stratification and lake turnover. These phenomena are very important for many aquatic organisms and allow for lake ecosystems to thrive. Water density depends on its temperature. The warmer the water, the less dense it becomes. Water is at its densest closest to 4°C. Liquids of different densities often do not mix easily. The greater the difference in density, the harder it is to get the liquids to mix. Think about oil and vinegar in a salad dressing. This resistance to mixing also occurs in water of different temperatures. Thermal stratification occurs when the water in a lake forms distinct layers through heating from the sun. When the ice has melted in the spring, solar radiation warms the water at the surface of the lake much faster than in deeper waters. In fact, sunlight often only penetrates a few metres into the lake, directly warming just the top few metres. As the water warms, it becomes less dense and remains at the surface, floating in a layer above the cooler, denser water below. Lake turnover is extremely important in freshwater lakes, as it is the event that is responsible for replenishing dissolved oxygen levels in the deepest lake waters. When a lake stratifies, three different layers typically form. The shallowest layer is that warm surface layer, called the epilimnion. 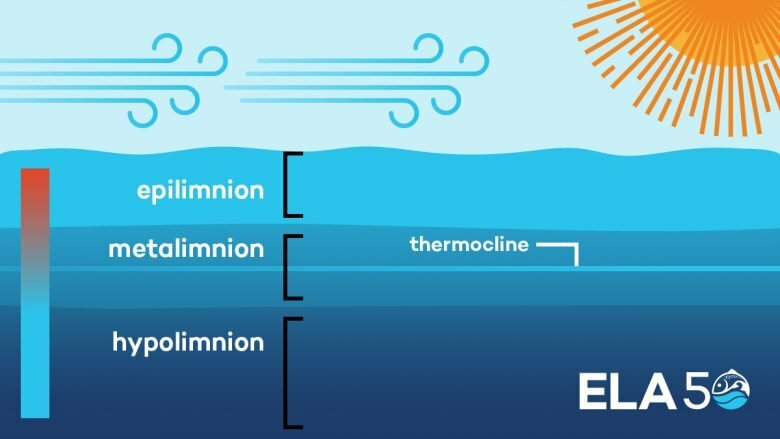 The epilimnion is the layer of water that interacts with the wind and sunlight, so it becomes the warmest and contains the most dissolved oxygen. Though dissolved oxygen doesn’t play a direct role in lake stratification and turnover, it is important for all the aquatic organisms in a lake that require oxygen to survive. The deepest layer is the cold, dense water at the lake bottom, called the hypolimnion. The hypolimnion often remains around 4°C throughout the year, rarely gets any direct warmth from the sun and is isolated from the air at the surface of the lake. The hypolimnion contains the lowest amount of dissolved oxygen and can often become anoxic (zero dissolved oxygen) while the lake is thermally stratified. The middle layer is the transition zone of water between the warm epilimnion and cold hypolimnion, called the metalimnion. The metalimnion is a place where the shallowest of the cool waters in the hypolimnion gradually warm up until they mix into the epilimnion. The point of greatest temperature difference (and therefore density difference) is called the thermocline and occurs within the metalimnion. Lakes stratify thanks to the heat of the sun and the movement of the wind. Throughout the summer, wind and waves cause the warming water in the epilimnion to mix deeper and deeper, slowly incorporating hypolimnetic water through the metalimnion. The ability of a lake to mix through wind turbulence is determined by the “stability” of thermal stratification. Stratification becomes increasingly stable with heating from the sun. The larger the difference in temperature (and density) between the epilimnion and the hypolimnion, the more stable the thermal stratification. When you are next swimming in a freshwater lake, impress all your friends by dipping your toes from the epilimnion, through the metalimnion and into the depths of the hypolimnion! Eventually, the epilimnion warms to the point where the difference in density between the epilimnion and hypolimnion (at the thermocline) is so large that wind and waves can no longer generate enough energy to incorporate hypolimnetic water. As the summer turns to fall, the surface waters cool and sink, mixing the epilimnion down towards the hypolimnion and weakening the thermocline; as the temperatures and densities of the epilimnion and hypolimnion become more similar, the water currents and wind can once again mix water between the two layers. Eventually, the epilimnion cools until the entire lake is the same temperature (isothermal). This allows lake turnover to occur. Lake turnover is a phenomenon whereby the entire volume of water in a lake is mixed by wind. This can only happen when the entire lake is the same temperature (and density! ), which in northwestern Ontario (home to IISD-ELA) generally occurs two times per year—once in the spring after the ice melts, and once in the fall before ice forms. Once the lakes freeze over for the winter, no new oxygen gets mixed into the lake from the atmosphere, and what is in the lake must last until ice goes off in the spring. Lake turnover is extremely important in freshwater lakes, as it is the event that is responsible for replenishing dissolved oxygen levels in the deepest lake waters. When the lakes are a uniform temperature and density, it takes relatively little wind energy to mix water deep into the lake. 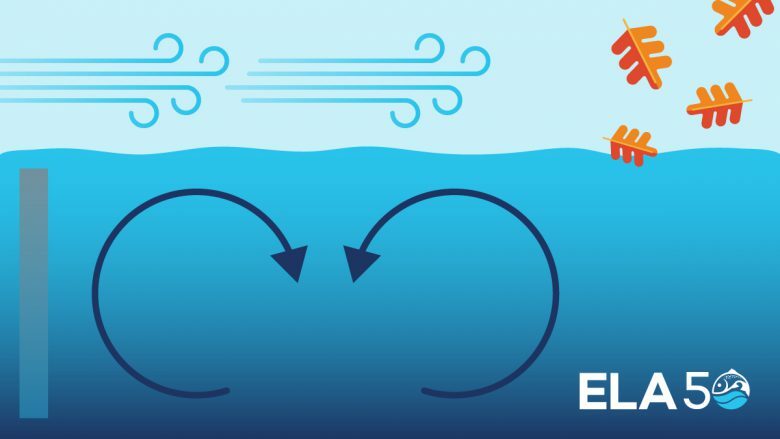 Wind moves highly oxygenated surface water to the lake bottom, forcing low oxygen water from the lake bottom up to the surface where it becomes saturated with oxygen. This is critical for aquatic organisms, as once the lakes freeze over for the winter, no new oxygen gets mixed into the lake from the atmosphere, and what is in the lake must last until ice goes off in the spring. Lakes turn over in the fall when the water throughout the lake reaches a uniform temperature. Spring turnover is important for the same reason. Once thermal stratification sets up, hypolimnetic waters do not get mixed to the surface and whatever dissolved oxygen exists in the deepest parts of the lake is all that is available until lake turnover in the fall. Remember that IISD Experimental Lakes Area is located in northwestern Ontario, Canada, in a region of temperate continental climate. Lakes around the world, however, may have different mixing patterns, depending on the local climate and altitude. Amictic: covered in ice all year. This mixing pattern is typical of lakes in the Antarctic. Cold monomictic: water never gets warmer than 4°C and turnover occurs once in summer. Lakes in the Arctic are often cold monomictic. 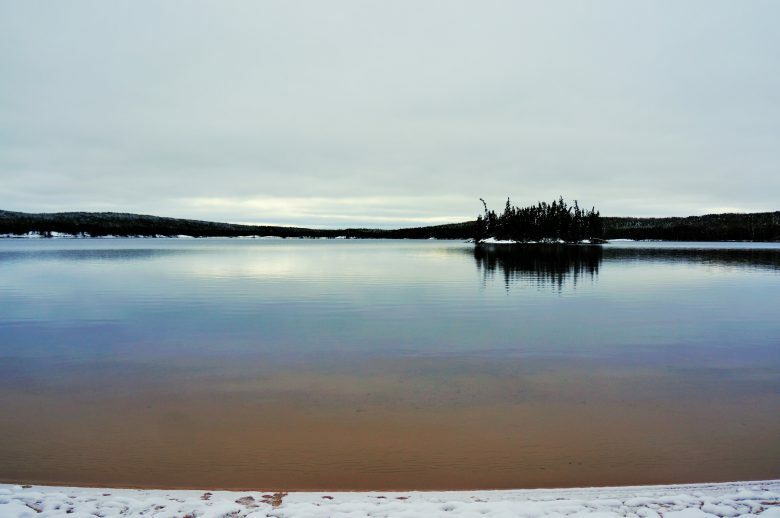 Dimictic: like at IISD-ELA, lakes are stratified in summer and winter, and mix once in spring and once in fall. Warm monomictic: water cools to near 4°C in winter, when turnover may occur. Lakes are stratified during other times of the year and are not ice covered. Lakes in the tropics or low altitudes in northern temperate areas can be warm monomictic. Oligomictic: water generally warm and stratified, occasionally cools to generate circulation at irregular intervals. This mixing type can occur in lower latitude regions where there is little variation in annual temperature. Polymictic: frequent mixing throughout the year. This type of mixing can occur in lakes across the world and depends on characteristics like depth, size, and shape of a lake. These are generalizations based on circulation patterns, and lakes can fall into many different classifications and classification systems. Many lakes can have periods of stratification, depending on lake depth. Shallow lakes may stratify following lake turnover and then mix completely for much of the year if sunlight penetrates to the lake bottom or there is enough wind energy to move water through the entire water column. So when you are next swimming in a freshwater lake, impress all your friends by dipping your toes from the epilimnion, through the metalimnion and into the depths of the hypolimnion!